/cm/ - Cute/Male » Searching for posts with the image hash ‘hhNc9aPMR026EnoV/gKKOg==’. Searching for posts with the image hash ‘hhNc9aPMR026EnoV/gKKOg==’. 1 results found. >Does he have any official material outside of the main story? How do you like them? How do you like his portrayal in them? He’s in a one-shot spinoff that was featured on a fashion magazine that doesn’t have anything to do with his part but it was nice to read. He’s a government agent who has to investigate a missing pet but he was a bit of a jerk to the person accused in the beginning. I still liked his portrayal though and the fashion was very nice and Gucci. He’s also featured in two light novels in which one is canonically ambiguous and the other one isn’t. I have yet to read the former because there isn’t an English translation, but I didn’t like his portrayal in the non canon one. It made him look like a reluctant and incompetent leader/capo who can’t keep his team under control. It also ruins several of his teammates including the original MC in favor to make the MC of the novel look good. 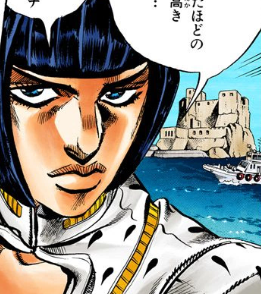 Other than that, he’s been drawn in fashion magazines and is a part of one of the main themes at a current art exhibition in Osaka with several other JJBA characters. >Do you celebrate or do anything special on his birthday? I’ve gone out and eat at fancy Italian restaurants and/or bistros for the past two years. I also enjoy listening to his favorite music. For next year, I plan to cook some of his favorite meals. >How often do you revisit his source material? With the anime currently airing, every Friday and/or weekend if I’m too into work and college. As for the manga, very recently but it’s by reaching out a few chapters explaining something to one of my siblings who’s an anime only.